All social media allows users to connect with friends, but for these sites, their primary purpose is for users to communicate with one another. Another major benefit of using these networking sites is the ease of connecting with companies, groups, organizations, celebrities, and peers with shared interests. You can then conveniently share their updates and content with your own personal networks. 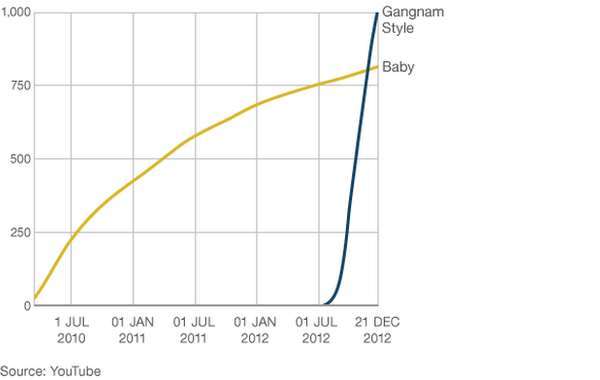 In the last year, people around the world were first exposed to K-pop (Korean pop) through the song "Gangnam Style." It's artist, Psy, has become a household name, and his follow-up single, "Gentleman," has also been a hit in many countries. So how did Psy go from a regional star to a global icon with a #1 song in the UK, Canada, France, Germany, Australia, and #2 in the US? He did it because of social media. Not trying to create a worldwide hit, Psy simply uploaded his now famous music video on YouTube and publicized the new song to his fans and audience through social media. But the beauty of social media is that once you introduce content, it is available to everyone and very easy for users to share what they like with all of their friends and fans. And if you have a strong social network, like American rapper T-Pain, who tweeted about "Gangnam Style" to his many fans and celebrity friends, you can reach an amazing number of people. T-Pain's 9-word message helped to send "Gangnam Style" on an unprecedented climb in popularity around the country and the world. Now while many of us are not trying to reach a global, or even national, market with our products and information, social media still plays a critical role in how we market ourselves. It allows people to easily connect with businesses to learn information and share their opinions about products/services. How businesses manage these interactions is crucial because of the huge audience on the Internet. This is perhaps even more crucial for local businesses because of their reliance on word-of-mouth recommendations and the increased ease of finding information about area businesses, due to location-tracking and GPS.